I'm using PostgreSQL with Sequelize as my ORM. I have one type, User. The second type is Group, which can have any number of users associated with it through a GroupMemberships table. Users can also own any number of Groups. My third type, Playlist, can belong to either a User OR a group. What would be the best way to design a schema for this type so that it can have either one type of owner or the either? My first pass I created both associations, but only populated one at a time. This could possibly work, but seems hacky and makes queries difficult. (1) If a Playlist is owned by a given Group, one can say that this Playlist is related to one-to-many Users, as long as they are Members of such Group, right? I believe this is technically true, but this one-to-many association does not exist explicitly. (2) So, is it possible for a specific Playlist to be owned by one-to-many Groups at the same time? No, it should not be possible for a Playlist to be owned by one-to-many Groups. (3) Is it possible for a particular Playlist to be owned by one-to-many Groups and, at the same time, by one-to-many Users who are not Members of such Group? No, because as in (2) a one-to-many from Playlist to Group should not exist. Additionally, if a Playlist is owned by a Group it is not owned by a User, and vice versa. Only one owner at a time. (4) What are the properties used to uniquely identify a Group, a User and a Playlist? They each have a surrogate primary key (id), as well as a natural key (though not primary). These are slug for Group and Playlist, and username for User. (5) Could a particular Playlist suffer an Owner change? Although I don't plan on this being a feature (at least initially), I suppose this could hypothetically occur. (6) What’s the meaning of the Group.Slug and Playlist.Slug attributes? Are their values stable enough to be defined as primary keys or do they change very often? The values of these two properties, along with User.Username must be unique, correct? These slugs are unique, lowercase, hyphenated versions of their respective entity's title. For example, a group with the title 'Test Group' would have the slug 'test-group'. Duplicates are appended with incremental integers. This would change any time their title changes. I believe that means they wouldn't make great primary keys? Yes, slugs and usernames are unique in their respective tables. If I understand your specifications properly, your scenario involves —among other significant aspects— a supertype-subtype structure. I will exemplify below how to (1) model it at the conceptual level of abstraction and subsequently (2) represent it in a logical-level DDL design. A User may be a Member of zero-one-or-many Groups. As demonstrated, Group and User are portrayed as subtypes that are connected by the respective lines and the exclusive symbol with Party, the supertype. The Party.PartyTypeCode property stands for the subtype discriminator, i.e., it indicates which kind of subtype instance must supplement a given supertype occurrence. Also, Party is connected with Playlist via the OwnerId property which is depicted as a FOREIGN KEY that points to Party.PartyId. In this way, Party interrelates (a) Playlist with (b) Group and (c) User. 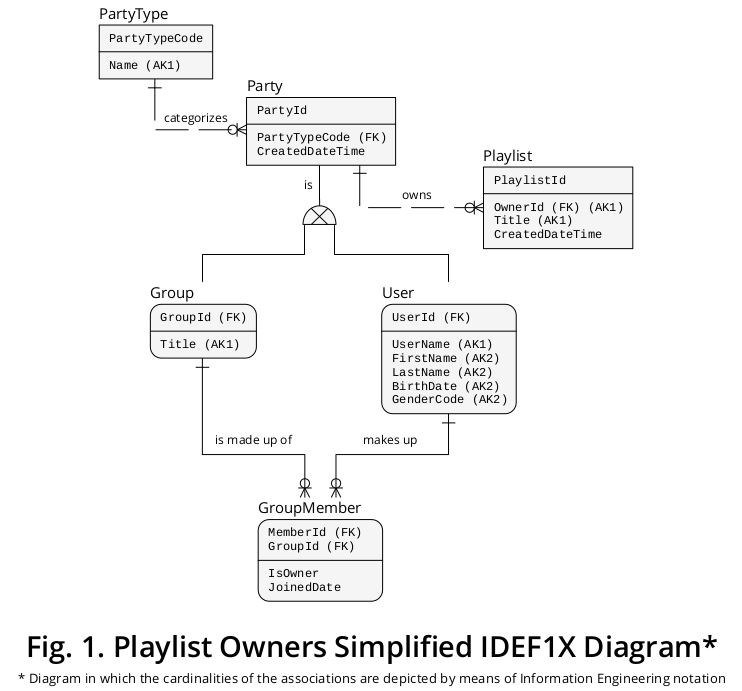 Accordingly, since a particular Party instance is either a Group or a User, a specific Playlist can be linked with at most one subtype occurrence. -- data manipulation tendencies of your business domain. CREATE TABLE PartyType ( -- Represents an independent entity type. CREATE TABLE Party ( -- Stands for the supertype. PartyTypeCode   CHAR(1)   NOT NULL, -- Symbolizes the discriminator. CREATE TABLE UserProfile ( -- Denotes one of the subtypes. UserId     INT      NOT NULL, -- To be constrained as both (a) the PRIMARY KEY and (b) a FOREIGN KEY. CONSTRAINT UserProfile_AK1 UNIQUE ( -- Multi-column ALTERNATE KEY. CONSTRAINT UserProfile_AK2       UNIQUE (UserName), -- Single-column ALTERNATE KEY. CREATE TABLE MyGroup ( -- Represents the other subtype. GroupId INT      NOT NULL, -- To be constrained as both (a) the PRIMARY KEY and (b) a FOREIGN KEY. CONSTRAINT Group_AK        UNIQUE      (Title), -- ALTERNATE KEY. CREATE TABLE Playlist ( -- Stands for an independent entity type. CONSTRAINT Playlist_AK     UNIQUE      (Title),  -- ALTERNATE KEY. CONSTRAINT PartyToParty_FK FOREIGN KEY (OwnerId) -- Establishes the relationship with (a) the supertype and (b) through the subtype with (c) the subtypes. CREATE TABLE GroupMember ( -- Denotes an associative entity type. CONSTRAINT GroupMember_PK              PRIMARY KEY (MemberId, GroupId), -- Composite PRIMARY KEY. Of course, you can make one or more adjustments so that all the characteristics of your business context are represented with the needed precision in the actual database. Note: I have tested the above logical layout on this db<>fiddle and also on this SQL Fiddle, both “running” on PostgreSQL 9.6, so that you can see them “in action”. one can conclude that their values are derivable (i.e., they must be computed or calculated in terms of the corresponding Group.Title and Playlist.Title values, sometimes in conjunction with —I assume, some kind of system-generated— INTEGERs), so I would not declare said columns in any of the base tables as they would introduce update irregularities. or, by virtue of application program code, mimicking the approach described before (perhaps procedurally), once the pertinent data sets are retrieved and formatted for end-user interpretation. In this manner, any of those two methods would avoid the “update synchronization” mechanism that ought to be put in place iff the Slugs are retained in columns of base tables. It is critical to mention that (i) each Party row must be complemented at all times by (ii) the respective counterpart in exactly one of the tables standing for the subtypes, which (iii) must “comply with” the value contained in the Party.PartyTypeCode column —denoting the discriminator—. It would be quite advantageous to enforce that kind of situation in a declarative manner, but none of the major SQL database management systems (including Postgres) has supplied the necessary instruments to proceed like that; therefore, writing procedural code within ACID TRANSACTIONS is so far the best option to guarantee that the circumstances previously described are always met in your database. Other possibility would be resorting to TRIGGERS, but they are prone to make things untidy, so to speak. since comparable scenarios are discussed. 1 Party is a term used in legal contexts when referring to either an individual or a group of individuals that compose a single entity, so this denomination is suitable to represent the concepts of User and Group with respect to the business environment in question. 2 Integration Definition for Information Modeling (IDEF1X) is a highly recommendable data modeling technique that was established as a standard in December 1993 by the United States National Institute of Standards and Technology (NIST). It is solidly based on (a) some of the early theoretical works authored by the sole originator of the relational model, i.e., Dr. E. F. Codd; on (b) the entity-relationship view, developed by Dr. P. P. Chen; and also on (c) the Logical Database Design Technique, created by Robert G. Brown. Not the answer you're looking for? Browse other questions tagged postgresql database-design schema subtypes or ask your own question. How to model an entity type that can have different sets of attributes? Design for a child to have a single parent `A` OR `B` with FK cascade constraint? Multiple Database Design or NOT? How to model the relationships (a) between properties and owners and (b) between properties and tenants? Designing MySQL Database For Two Different User Types (Staff and Client)?